Johannesburg (Agenzia Fides) - “Oh city of Johannesburg, what kind of a mother are you? Are you not supposed to be like a mother who gathers all her children? As a hen gathers her chicks under her wings?” (Mt. 24.37), warns His Exc. Mgr. Buti Joseph Tlhagale, Archbishop of Johannesburg, in his Lenten message focused on welcoming migrants in the economic capital of South Africa. The integration of migrants from neighboring African countries (Mozambique, Zimbabwe) and those far away (DRC, Nigeria) but also from some Asian countries, is a hot topic in the Rainbow Country. Mgr. 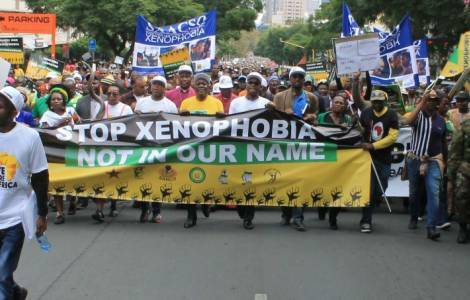 Tlhagale denounces "the harrowing living conditions of many migrants and refugees who have become the surplus people, the homeless people, the unwanted people, the “scum of the earth”. We must also include in that context people who live in the informal settlements. They too are virtually homeless. Their living conditions are unpleasant and brutish. People have been painfully deprived of their sense of decency and God-given dignity". This is why the Archbishop of Johannesburg says that the "the most beautiful city on the African continent", as it was once called, is now a place "in ruins and full of squalor. You are indifferent to the suffering of strangers. You are indifferent to the pain of your own homeless, hungry and diseased children!" Recalling the words of the Scripture that "describe the conditions of many migrants and refugees", Mgr. Tlhagale urges the faithful to become aware of their tragedy: forced to beg because they lack the documents and the qualifications required to find a job, many of them sleep under bridges, wandering aimlessly around the city, sometimes annoying motorists.